Although the photo shows the glider airborne, [at a pretty ferocious angle of attack], some months without wind had gone by after it was ready and then after a day or so of flying, calm weather set in again. When the Wrights finished their first glider, they consulted the United States Weather Bureau for a suitable windy site and selected Kittyhawk, North Carolina. They were by no means omniscient, however. They had, apparently, not considered gliding from a hilltop and the existence of the Kill Devil Hill, 4 miles from their campsite, was apparently fortuitous. Frustration with the glider had a not unpredictable affect on Uncle Jack. He got the bit between his teeth and determined to have some real flying. 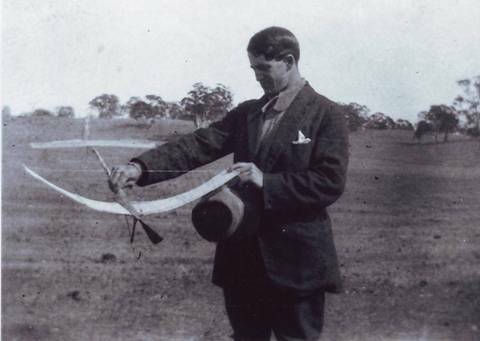 Apparently, while whistling for some wind, he began to consider how to go about the thing properly, just as the Wrights had done after they decided to turn their attention to flying. The solution he adopted was more obvious and at the same time more logical than theirs. Since powered flight was the object, building a powered machine on wheels and little by little leaving the ground on it, is as likely a way of achieving success as practicing on a glider and then changing to power. And the choice was made in the face of the popular report he received from his correspondent on the methods of the worlds premier aeronauts. One of the inexplicable things about the Wrights career was their failure to carry over the light, strong wheels of their cycling days into flying. 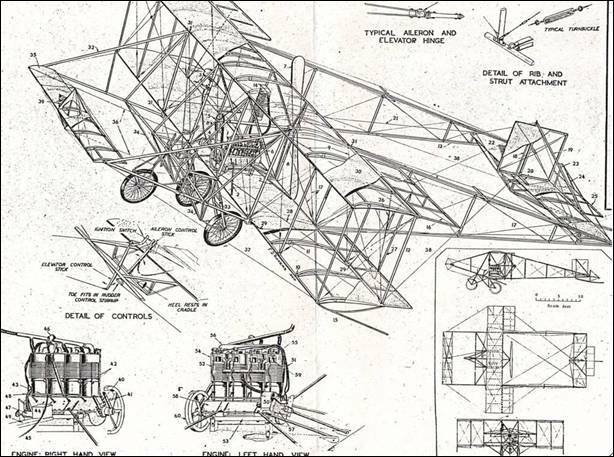 At the time uncle Jack was starting on his design, Stanley Featherstone was sending out anything on aviation, he could lay his hands on, [although he had no actual contact with flying or flyers]. So the appearance, at least, of the aircraft of the time would be familiar. The Voisen, made up of box – kite cells with no lateral control, [I haven’t yet fathomed how, the so called side curtains promoted lateral stability, since they seemed to resist the side slip necessary to make the dihedral act]. Then the Bleriot, with equal monoplane wings front and back and with ailerons on the front wing tips and the Farman version of the Voisin, which was probably Uncle’s starting point. 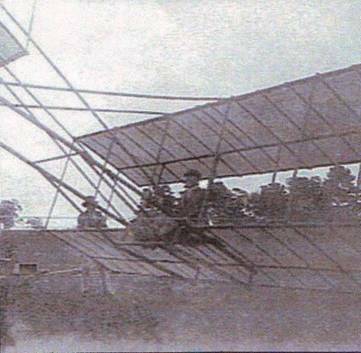 Then the oddities like the Santos Dumont 14, the first to fly in 1906, which appeared to be a tractor biplane made of pocket kites which in fact flew backwards and the Esnault Peltrie 2, which had most of the essentials but disposed of them in funny places. All these machines were on wheels, but the daddy of them all, the Wright, was still on skids. As his soul guide he started with Hiram Maxim’s book, ‘Natural and Artificial Flight.’ In the eyes of , at least one present day authority, Maxim as an aviator, was a good artillerist, and a good deal of his book is of doubtful value, where it is not positively misleading, However his investigations of lift and drag values of fairly plain aerofoils, was possibly more useful than most of the tables prepared by the pioneers for their own favorite highly contorted shapes. We have a 1909 article by Professor Herbert Chatley B.SC., A.M.I.C.E ., who gives a totally unremarkable section in the shape of an S on its side, with the trailing edge given a pronounced upwash; which shows the sort of morass of misinformation surrounding the subject at the time. Although this is an extreme case. The usual trouble in estimating the performance of a wing section, was that the number of variables operating was not properly pinned down. 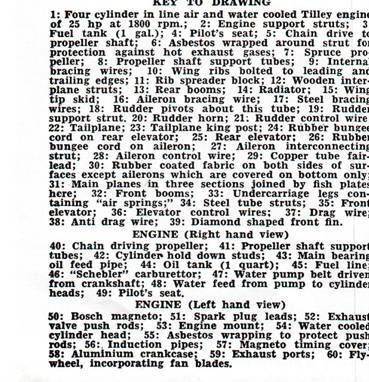 Anyway Uncle Jack made a number of trial estimations of likely weight, areas and speeds necessary to sustain them, and the power and propeller efficiencies required for these speeds, largely based on Hiram Maxim. He claims that they proved very accurate. In making the machine he got down to the designed weight all right, when he eventually achieved the designed power, the machine flew at the designed speed. In fact, I think he was being a little smug or the report of his remarks was over simplified, because no accurate means of measuring power output seems to have existed. With the general dimensions settled, a good sized shed was built about twice the size of the Wright’s, because although the span was to be the same, the Duigan was to be a lot longer and instead of being fitted in sideways and having to be carried out, it was to emerge straight ahead on its own wheels. Uncle Jack didn’t have to build the shed himself; he had it built for him, which shows the advantage of working on a fair sized station ‘where at a pinch’ quite a few helpers are available. In the same way when production got underway, Father was entrusted with a great deal of the repetition work. 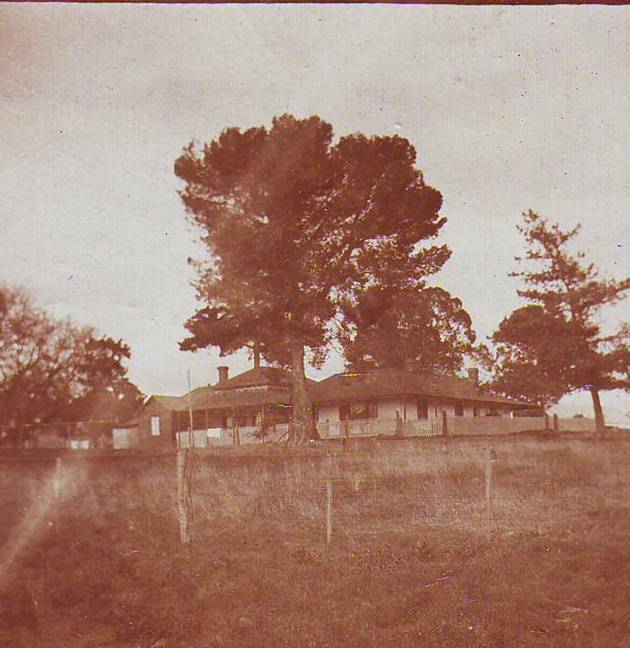 Here is Spring Plains homestead, the land straight ahead drops down to a creek which was on one side of the flying field. Now seems to be a good time for a break away from the strictly aeronautical side of this talk in order to give some idea of the surroundings. This photo shows the state of mechanization of the time. This is the wool clip departing for Melbourne, some 80 miles away over rough going, that this sort of road train did nothing to improve. The usual system was by rail from Redsdale, only a few miles away but freights were quite high and road hauliers, [with a prime mover that lived off the land by means of an axe and a pump], (I think you can see the pump on the back of the traction engine) were already beginning to make a nuisance of themselves. The more docile looking engine in the background, drove the shearing machines, sawed wood and so on. Internal combustion engines had been in use for three or four years before the beginning of the aeroplane, in motor bikes and a couple of motor buggies. The latter anticipated planned obsolescence, by each breaking its crankshaft after exactly 2000 miles. For the aviation program, a small treadle lathe was added to the workshop which had a fair selection of carpenters tools, metal drills, files, hand grinder and so on. There was also the blacksmith’s shop and the addition of a large brazing lamp made it possible to join quite large sections. 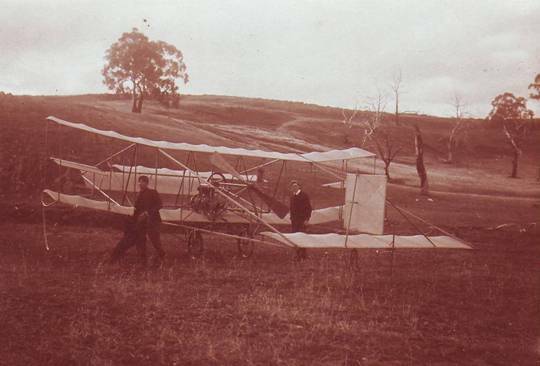 While Uncle Jack was at his full size aeroplane, Father made a rubber powered model which was flown with great success in a competition at the Melbourne Cricket Ground. It was fully stable and was able to be launched on its side or upside down. It was the only competitor to fly but was not awarded the 100 pounds prize, an injustice that still rankles. Apparently because it looked so simple beside its elaborate Kiwi rivals. To round off the build up we should have a picture of Uncle Jack. It will probably never be possible to establish how much of Uncle Jack’s work on the first plane was original so that his status as a pioneer shall remain undetermined. 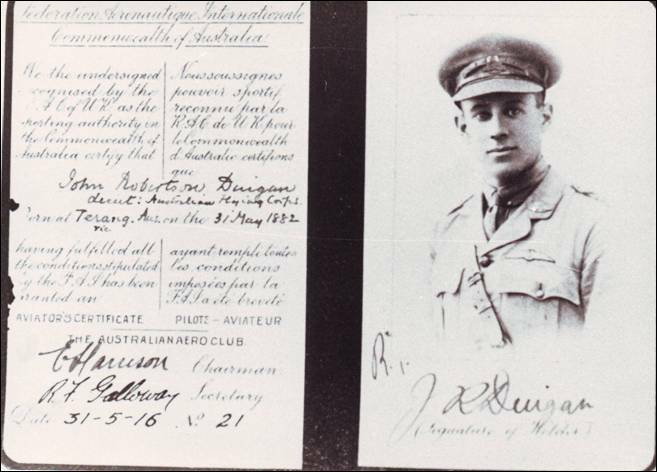 But I do not think there are many of his contemporary investigators who went through the World War 1 on general duties and finished as a Captain, with a Military Cross. . In fact, the kind of temperament necessary for research was likely to be a distinct handicap in war time flying, where a nice appreciation of the laws of probability can be no help at all. In so far as the plane was a Duigan brother’s production I should have a picture of Father but he claims to never have had a portrait made, although that seems unlikely. Anyway he is in the audience and can be examined at leisure during the commercials. We could find only a very faded photograph of the first plane. To help you follow the plane’s evolution, therefore, we will have to have a picture of it in its final form and work back from there. This is a drawing for an article in Aircraft prepared by Mr. Rodgers, a couple of years ago, and is very accurate indeed. For the moment, all I want to show you is the general configuration, a braced biplane with pusher propeller, twin booms carrying the empennage at the back and elevator at the front.